At just one metre long, the Match 1m basin with an integrated worktop area is extremely practical. It is manufactured using Isocast, a mineral substrate topped with a tough resilient gelcoat to give a glossy finish which is both durable and easy to clean. The look is seamless and modern. A basin depth of 380mm makes it very space efficient and it is available either left or right-handed to suit your room layout. 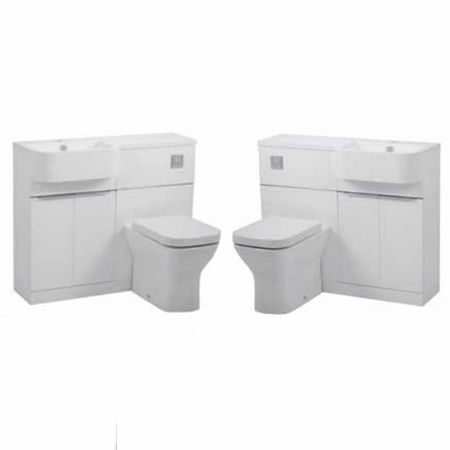 A single compact one metre unit which incorporates a 500mm basin unit and a 500mm back to wall unit. Available in two contemporary cross-cut style textured wood finishes as well as gloss white, it is set off by touches of chrome on the discreet door handles and toilet panel trim. Installation is very easy, with no cutting required to fit the basin.